Elaine Davidson – Worlds most pierced woman, originally uploaded by Swiss Bones. 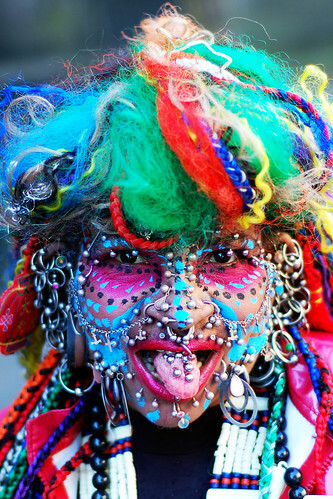 The most pierced woman in the world according to the Guinness Book of Records. Elaine is from Brazil but now lives in Edinburgh. She claims to have over 4200 piercings. One of the benefits of reaching middle age is that it provides me with a believable excuse for avoiding certain lifestyle decisions that challenge younger men. The choice I am especially happy to pass up is whether or not my physical appearance would be improved by wearing an earring. Don’t get me wrong. I have no objections to guys sporting jewelry wherever and whenever they desire. But we all grow up within a particular set of behavioral boundary lines, and being well past the 5-decade mark, I know which boundaries in my own life cannot be straddled gracefully. The rules on this subject were clear and specific when I was a kid. In those days, men who wore earrings were classified as dangerous outlaws (motorcycle gang members/pirates), social rebels (beatniks/musicians/artists), or commercial icons (Mr. Clean). Responsible, middle class adult males didn’t even consider the possibility. My dad was part of the generation that fought and won World War II. For him, the notion of wearing an earring to work would have been as incomprehensible as wearing a toga, and I have inherited his no-frills approach to personal attire. But during the past couple of decades, lifestyles and cultural attitudes have inexorably changed. Earrings for men are now part of the daily wardrobe. But I have no plans to revise my current dress code. Displaying ears unencumbered by foreign objects suits my personality. I feel the same way about my neck, which is probably why I never started wearing gold chains back in the ’70s. Clint Eastwood spoke an unforgettable line in Magnum Force, and it applies perfectly to this situation: “A man’s got to know his limitations.” I don’t possess the aesthetic judgment to decide which ear to use, or whether a ring is more impressive than a simple stud. I am, however, curious as to how far the trend will spread, especially in the political arena. At what point along the campaign trail are we going to see a male candidate for president step onto a podium and proudly display ears enhanced by fine jewelry? Come on Mitt, Barack, Rudy, Dennis, Fred, all you guys in both parties who want the Oval Office — a rendezvous with destiny is looming. Who among you is bold enough to pierce the ear barrier and set a new political standard? If not now, when?? America waits, and wonders.